Jo Soley works with heart-centred female entrepreneurs who are overwhelmed with their marketing to provide clarity to produce a steady flow of ideal clients to reach their desired monthly income target. Jo’s journey into entrepreneurship began with a career in retail management working for large retailers within the UK. After 25 years she decided it was time to work for herself. Entering the entrepreneurial world she started by attending local networking events. However, when she began networking her business was not focused as in a single niche as she offered a wide variety of services ranging from social media management to event management. This was the typical spray and pray method many people try when they get started. The thought is if you put out enough offerings in the market, at least one of them will generate revenue. While it is great in theory, it doesn’t result in long-term results as potential clients are unable to get to know who you are. As her business grew she focused her business primarily on women. It is important to note that when you niche down, it doesn’t mean you do not work with other individuals, it simply means your message is refined to attract a primary type of client. Additionally, when you focus on a niche, it results in increased efficiencies in your business. If you work with a wide variety of businesses there will be little overlap. However, when you work within a niche, the strategies that work with one client will often work with several others. For entrepreneurs in today’s world, using online lead generation within their niche is far more powerful than solely attending networking events. 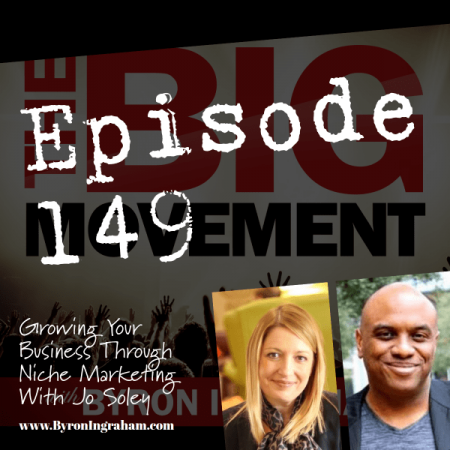 The One Thing Jo recommends is for entrepreneurs to get clear on who their ideal clients are. You want to build your business off of what your ideal clients want to buy, not what you want to sell.